Two L.A. entrepreneurs have dreamed up the perfect plane for the weekend aviator. Meet your new lust object: Icon Aircraft's A5, a stealthy little airplane that can take off and land on water, retract its wings like a diving sea hawk and log screen time in two major movies, even though it's a more than a year away from rolling off the assembly line. 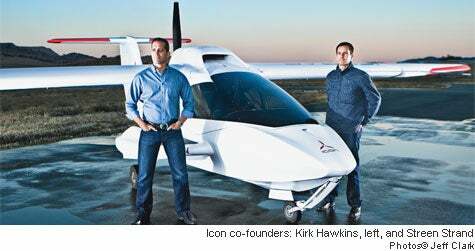 The A5 is the creation of Kirk Hawkins and Steen Strand, two Stanford University grads who decided to design the perfect plane for a new class of aviator: the sport pilot. Five years ago, the Federal Aviation Administration made it easier for people to fly when it designated a "sport" license--anyone with a couple of weeks and $3,500 to spare can get the certification. And the A5, a groundbreaking aircraft, aims to inspire everyone to do just that. Hawkins is an engineer with a deep flying background (think Air Force F-16s, American Airlines 767s, you name it), and Strand is the inventor of Freebord, a skateboard-snowboard hybrid, and a former engineer with glam design firm Ideo. They call the A5 a blend of "badass" Apple and BMW product design, powered by engineering courtesy of the rocket scientists they wooed away from Burt Rutan's famed aerospace firm, Scaled Composites. Since the pair started the Los Angeles company in 2005, investors have parted with roughly $40 million to literally get the project off the ground. "It should appeal to people who don't already own planes," Hawkins says in his pitch, "so I think we're going to get a piece of all the discretionary income that people build their lifestyles around." He expects demand for a couple of thousand planes a year, which translates into a company worth $500 million. It helps that at $139,000, the A5 is competitively priced (and just in case you're thinking about it, it flies up to 15,000 feet with a top speed of 120 mph). "I mean," he asks, "would you rather have another sports car or a plane?" So far, pre-orders have surpassed 400. Hawkins and Strand also recently closed a toy deal for a remote-controlled version of the aircraft and managed to get those cameos in Iron Man 2 and Knight and Day. Ultimately, they say, Icon planes are designed to capture the joy of flying--imagine taking off from the waters off Long Beach, Calif., where the plane was tested, then cruising up the coast and landing in Santa Barbara for dinner. "When we're children, the way we dream of flying is different than what it turns out to be--planes are just a way to transport things from A to B," Strand says. Flying an A5, Hawkins says, "is like [being in] the front row of the IMAX."